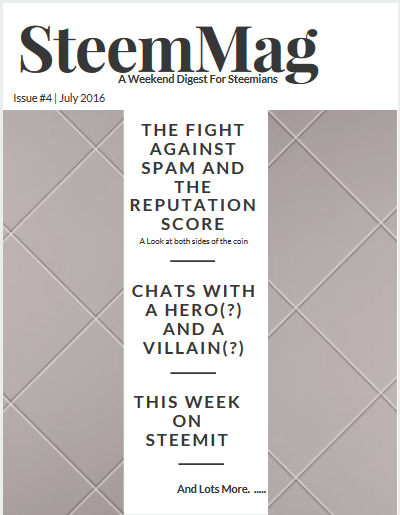 I’m delighted to welcome you to the fourth edition of SteemMag, A Weekend Digest For Steemians… Every week, I take a look at some of the most important topics and have a chat with top Steemians who have expert views on such topics. In case you missed it, here are links to Issue #1 , #2 and #3. This weekend’s special feature will be examining one of the most controversial topics on Steemit right now – ID theft and plagiarism. Also, we will also be taking a look at the most important event this week on Steemit – The release of the reputation score to combat spam. I interviewed two well-known Steemians…… A popular Hero(?) and An unpopular Villain(?)…. Going through their chats will help in forming conclusions about the newly introduced reputation score. The first chat is with a really unpopular Steemian. His works are everywhere on Steemit. And I’m certain, you’ve encountered quite a number of them. And you probably hate seeing them. I believe there is a story behind every action so I sought him out to hear from him too. I hope you enjoy it. SteemMag: How did you get to know about Steemit? S: How many bots do you have? and why did you decide to go the bot way? 350 roughly with 44 or so accounts actually live. I didn’t actually decide to take the bot route it was just one tool I wanted to use to test Steemit. To be fair, I specifically set out to break stuff. I understood I was taking a route which would grab attention. Most of the recent changes to Steemit were direct responses to my bots. I’m happy the devs took routes that weren’t overly complicated yet still addressed certain issues. S: Can you list the names of some of your bots? My code is a bit more involved than most I would say. I can set any of 100 variables and the bot will decide who does what, where, who to avoid etc. The only reason they actually have neg reps is because I specifically set them up to be publicly viewable. Isaac.asimov isn’t mine and just repeats 1 specific paragraph. My bots can have unlimited responses that are randomly chosen. For testing purposes I only input 3-4 random responses as I didn’t care if they were spotted. A lot of Steemians complain that bots do nothing, spam posts and still earn a lot on Steemit. Some see them as evil and to an extension; they don’t seem to like you? At this point in time, I agree. It's filled with stupid bots. I expect them to get better though. Well, to be fair they are justified to not really like me or my bots. They were annoying and by extension, I am annoying. I should also note to #2 I didn’t specifically set out to help Steemit, I just wanted to break it. Devs deciding to address what they saw was just a happy bonus for Steemit users. We all know AI and by extension, bots are the future? Do you have the capabilities of running smart bots that would contribute positively to the platform? The reputation score was recently released hitting your bots badly? In your opinion, are the scores fair and what are your plans to improve this? The REP system is a wonderful addition. You now have two scores to nurture/cultivate. Your weight on the platform (SP) and your Public Reputation (Rep). Yes the rep system slammed my known comment bots hard. The rep system isn’t perfect and will probably need refinement but it’s a good start. I should also note that the rep system only works onknown bots that have commented publicly. Voting bots that haven’t commented aren’t affected by the rep system, although I would suggest anyone running a voting bot to build in a resting period. SteemMag: Where do you see Steemit in the near future? I could show you better than tell you. I have already looked into using steemit tech for a completely unrelated platform (Basically not competing with Steemit yet larger and more profitable niche wise). Those with web development and other associated skills are welcome to join me. Next is a chat with @anyx. the owner of Cheetah, has been a leading figure in the fight against plagiarism and ID theft. The reputation score was released for each Steemian this week. What are some tips you can give to steemians a. to protect their score from tanking b. to improve their score? The reputation score is interesting, to say the least. I have found serial plagiarists with +7, and normal people with -5. My point for this is that the number doesn't always reflect reality, and should be taken with a grain of salt. To make sure that one’s core reflects their actual reputation, the best thing to do is build real reputation first, and not worry about the number. By making your mark, and posting original work and content to Steemit, your number will naturally go up! And you will get rewarded through persistence! If you plagiarize something, however, we will catch you; we find cases with $1000 pending payout and 5 rep, and have pushed them to nothing and -5 rep in an instant. S: What are the biggest challenges you've faced running cheetah? There have been plenty of solved and unsolved problems with cheetah in terms of bot stuff, but the biggest problem is actually with people. Not everyone agrees with what I am doing. Steemit has drawn a large anarchist crowd, and with them sometimes comes people who don't believe in plagiarism or copyright. As an academic, I am on the other side of the fence and I have had arguments about this stuff, which has led to personal attacks and abuse, as well as people flagging all my content. The biggest challenge of people is getting them to understand that copy-pasting stuff is not a good idea. While they are accurate that the blockchain has "no defined rules or takebacks", the website steemit.com does. And if we want the website to go mainstream, we need to be very cautious to protect the future of our site. A second challenge or problem with cheetah is the way people interact with her. Most people are still frustrated with it despite the reduced message. This is unfortunate to me; since it sort of shows that the stance on plagiarism here is more "vigilante actions" rather than an understood practice on the site. I hope that @dan and @ned explicitly clarify their stance on content in the future, as I am sure they are already facing DMCA notices. You recently stated that you go through some of cheetahs action every day as a form of review? What is the most blatantly plagiarized comment/post you've seen? The worst blatant plagiarism I have seen was a copy paste of my own article... on cheetah. I mean, come on, really? But in general, there're hundreds of catches per day already, and it can be too much to sift through. It's also very important to note that cheetah doesn't catch everything, and never will be able to. So we still need people manually checking articles, we need people to verify and have their credibility and reputation on the line, and unfortunately this is not a practice the general population is used to. Fortunately, there are awesome people in the #steemitabuse-classic channel in steemit.chat and they are always on the ball looking out for plagiarism. We invite anyone to come join, chat, and help us whenever they have some spare time. We're a friendly bunch! Where do you see Steemit in the next few months in terms of quality of posts created? This is a tough question that I don't have really have an answer to. Ideally, I would love to see promotion of original content here, with the most interesting stuff getting the spotlight. I don't want to see an influx of plagiarism and copy paste, but at the current rate, that is exactly where we are going. It is a constant problem, and will always be when people have dollar signs in their eyes, and see an avenue for a quick buck. We, as a community, truly need to decide what we want to see in steemit. I don't think there is a balance; if we let people copy paste, and the community doesn't take action to show people that it is unacceptable, then that is the type of posts that we will descend to in the future -- especially as we become more mainstream. Thanks @anyx for taking the time to do this. It is really interesting to hear from those who are fighting spam and plagiarism. If you’ve got questions for him, I would see if I can get him to answer a number of questions. There you have it. I hope you do enjoy today’s special feature…. Do check out page 2 for more awesomeness, follow my blog and watch out for next week issue. It’s gonna be exciting. @infovore Steemmag is an incredible resource for every member of Steemit and even more so for late adopters or those of who are still trying to figure out the lay of the land and some of the complexities (as simple as they may come to most). @Cheetah's progress is unprecedented in the AI community and I couldn't be prouder to be a contributor and curator for such an unrivaled social-media platform! This is an invaluable well of information in this wonderful ecosystem we have helped to create here, as a community, that is based on reliability, trust and above all: Insight and Knowledge. Thanks again for making this exclusive information available to us! This is the type of content that makes Steemit the newest and largest Social-Media Platform. Can't wait for Page 2! Thanks! And no problem! I truly appreciate all of the work you do for Steemit and us Steemians. Excited about, and ready to read Page 2 now! To @anyx point, as an amateur painter/photographer and professional writer, I try and post only my highest quality Original content to help improve our community and keep an eye towards our future! If anyone wants to check any of my original content out: @scaracara always upvote for upvote. You should include @jeeves into this! My bad! Will look into that. Thanks @jasonmcz for your support. Good info thank you. I've never understood why some of the bots are here but I haven't had any problems with them either. Having a neutral perspective is cool too. As long as they dont ruin the platform for we, humans. We are cool with them. How many bots did upvote this post? Just kidding. Another great issue @infovore! @anyx, I know what you mean...from my side, I will try to produce original content everyday! You already produce amazing contents regularly... Thanks for the compliment. And as usual, looking forward to your next post. Thanks man! That means a lot! Thank you! I'm happy you found it useful. Thanks. Good post and very interesting to see some expert opinions on this. I just assumed that bots would hurt or get you banned on here. Will have to read the other posts to get more educated. Cheetah is evolving very fast. I think cheetah is a godlike creature. Best bot around.